We have “officially” closed the cross-country traveling chapter of our lives…because there is no more RV to travel around in! A few weeks ago, we finalized the sale of the coach to a most wonderful couple named Kevin and Annmarie Gianni. They contacted us even before we had officially put the RV on the market…looking to find a “green RV”. 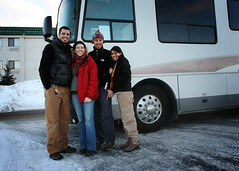 They flew into Bozeman on a Friday night, and all day Saturday we taught them the “ropes” of the RV, how to gather veggie oil, what this button does, what this door goes to…they were complete newbies, but we had total faith that they would do fine all the way back to Connecticut. And they did. Beginning this spring, they are going to be heading out on a tour of their own…speaking all over the country on a topic that is near and dear to our hearts…raw food and holistic nutrition/health. Woooo! Kevin and Annmarie are a powerful voice and a wonderful example of how we can live healthy lives. They are so laid back and “real”…you can’t help but to like them. Check out more about them at their website, www.liveawesome.com. Be sure to register to receive their hilarious and informational online health show. They filmed their trip back home from Bozeman, and it’s quite amusing. Well, I’m sure that they wouldn’t categorize getting stuck in an ice storm amusing, but they’re just fun to watch. I would highly encourage you to follow them as they tour….we’re sure looking forward to seeing them again in Montana! Saying goodbye to this RV wasn’t nearly as hard as leaving the blue beast…there were just so many more memories linked to that one. But it was an emotional transition nonetheless. Especially for our little princess. Well, at least for about 5 minutes…and then she was on to something else We reassured her that we would still be able to travel without an RV, but we would just do it like normal people…in a car! That was a new concept for her. You can see more photos of their visit here (including Bella’s very sad face). We are still LOVING Bozeman and being settled. Just today, we found a kitchen table and chairs on Craigslist (we’ve been without for over 6 months!) and it’s amazing how the little things in life are such luxuries right now. I am 21 weeks pregnant…and everything is progressing nicely. Measuring perfect and a strong heartbeat. Lots of kicking going on as well. Life is good. I’ve been editing photos from the last leg of our trip and will post those blogs sometime before 2012.